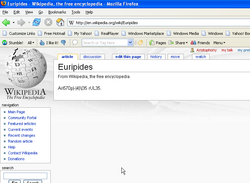 Those obsessed with drama should thank the Muses that Wikipedia has an article about: Euripides. 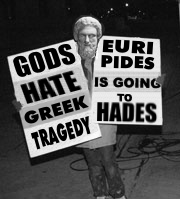 Voyage on http://www.euripides.com to days of yore! Whoops! Maybe you were looking for Euroipods? This alphabet isn’t really an alphabet at all — it’s just an abjad. 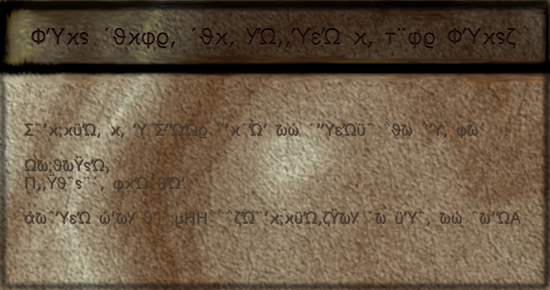 You can vote for or nominate your favourite syllabaries at Dulkw ’ahkepedia:VFL. Shh! — tragedy and comedy are being performed ... or rehearsed. After the pompe are choruses of goat-songs, hymns and dithyrambs for Dionysus to enjoy. then go put your eyes out. Seriously, the Panathenaia is for suckers. Hypothetically speaking, if there were a God, and there isn't, it is likely that He wouldn't support this article, and any facts it contains. As it turns out, divinity is a polytheistical mess with a multitude of gods, many of whom do support this article. So if this article should fall victim to Vandals or Goths, there is a good chance that those Germanic idiots got confused and thought they were sacking Rome. But if you decide to let your naughty tendencies take control, know that several plagues will be inflicted upon you simultaneously, making your life here just a wee bit uncomfortable, not to mention itchy. 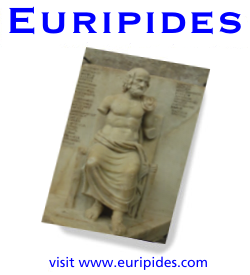 Aristophanes, who performed stand-up at the Old Attic of Comedy, infamously said of Greek tragedy, "Can't live with it, can't hang it, choke it with poison, push it off a tower and feed it to Cerberus. Hey, did ya hear the one about The Frogs?" So our destiny is controlled by three grannies with magical knitting needles and a pair of scissors, probably living together in a house that stinks of ouzo and cat piss? And the sun is just a golden basketball used in Mount Olympus' Intra-diety League and earthquakes are caused by Hephaestus and his fiery-mad dunking skills? The Earth is supported by a stack of pigs, you say? And stars are merely holes punched within an all-enveloping black curtain through which all the gods are peering and laughing, laughing and peering? Wow, bet you could use that outlook to justify a helluva lot — slavery? The subjugation of women, perhaps? Tyrannical empowerment by a few over the many? At least it's heartening to know that we live in times far removed from such a superstitious, backward mentality and nobody fears a group of malevolent beings who reign eternally and enact suffering upon us capriciously. Now we've just got one. Go Jehovah! San Francisco - The one place in the U.S. you can still go Greek!!! This author won a laurel crown at a drunken festival in 441 BCE (ish).